The death of U.S. Supreme Court Justice Antonin Scalia, a conservative intellectual giant, ignited an immediate partisan war over both his legacy and whether President Obama should be allowed to appoint a justice to the Supreme Court during his last months in office. 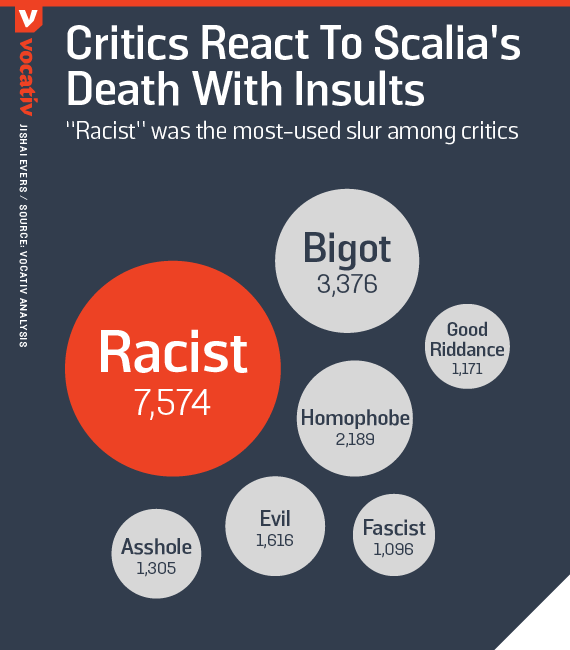 Hundreds of thousands of Scalia supporters and critics took to Twitter to battle, with Scalia’s backers hailing him as “brilliant,” “influential,” “dedicated,” and a “patriot.” His detractors, meanwhile, unleashed a torrent of disgust, calling the powerful figure a “racist,” “bigot,” “homophobe,” or worse. Vocativ used our deep web technology to analyze more than 900,000 tweets mentioning Scalia in the hours after he was found dead Saturday morning at the age of 79 at a resort in Texas, where he was on a hunting trip. 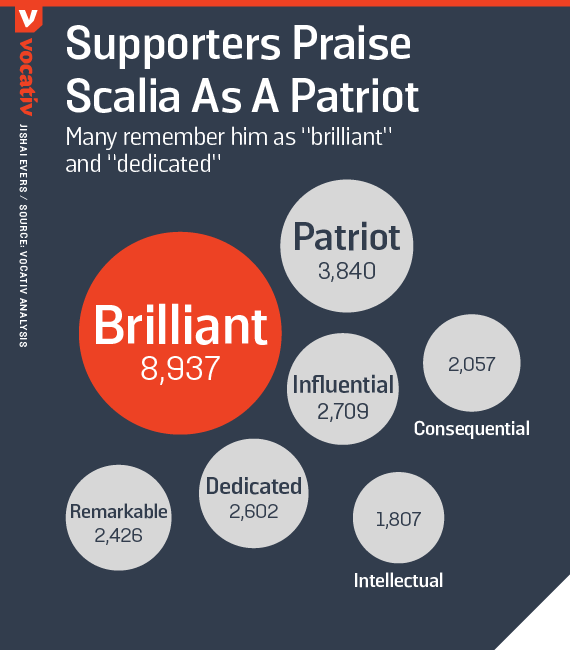 “Brilliant” was used the most among typically complimentary words, appearing in 8,937 tweets about Scalia, although in some cases the same word was used to attack him. “Patriot” and “influential” also ranked high with 3,840 and 2,709 mentions, respectively. 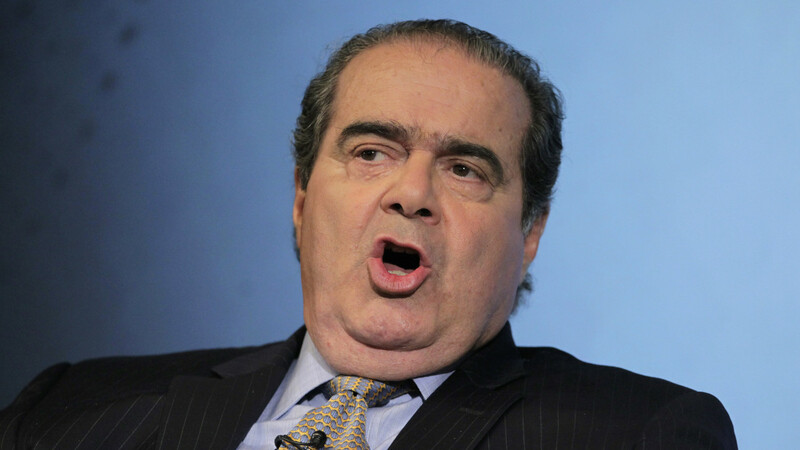 #Scalia A bigger vocabulary than Shakespeare, a good friend to RBG & EK, a brilliant mind. Obama and Congress do your jobs & pick well. The top insult was “racist,” leveled 7,574 times from Saturday afternoon through early Sunday morning. That reaction was at least partially rooted in backlash over his views on affirmative action policies in universities. In a December affirmative action case, he said: “I don’t think it stands to reason that it’s a good thing for the University of Texas to admit as many blacks as possible.” He suggested that some black students may be better off at “less advanced” schools, causing a wave of uproar. 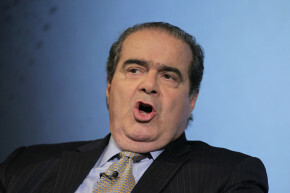 Happy to hear that #racist #Scalia is no longer a #Supreme #Court #Judge. BTW it isn't inappropriate to note that Antonin Scalia was a horrid regressive bigoted little toad who vastly harmed this nation. On social media and beyond, many remembered Scalia with respect. “He was an extraordinary individual and jurist, admired and treasured by his colleagues,” said Supreme Court Chief Justice John Roberts, according to the Associated Press. “His passing is a great loss to the Court and the country he so loyally served. We extend our deepest condolences to his wife Maureen and his family.” Senate Minority Leader Harry Reid described Scalia as a brilliant man and a dedicated jurist and public servant. Obama then announced that he plans to name a successor to Scalia, calling it a constitutional responsibility and showing no interest in allowing the next president to bring the nomination. Prominent Republicans are vowing to block any move by Obama to fill his seat, assuming the president would pick a more liberal successor and alter the ideological leaning of the court. , a conservative intellectual giant, ignited an immediate partisan war over both his legacy and whether President Obama should be allowed to appoint a justice to the Supreme Court during his last months in office.